#1 Will European markets crash or surge after the ECB ends its trillion euro stimulus programme? In the last quarter of 2018, the European Central Bank (ECB) decided to end its multi-trillion euro bond-buying programme that started in 2015. This was known as ‘quantitative easing’. In this scenario the central bank creates money by buying securities – such as bonds – from banks with electronic cash that did not exist before. Two major markets were affected by this. 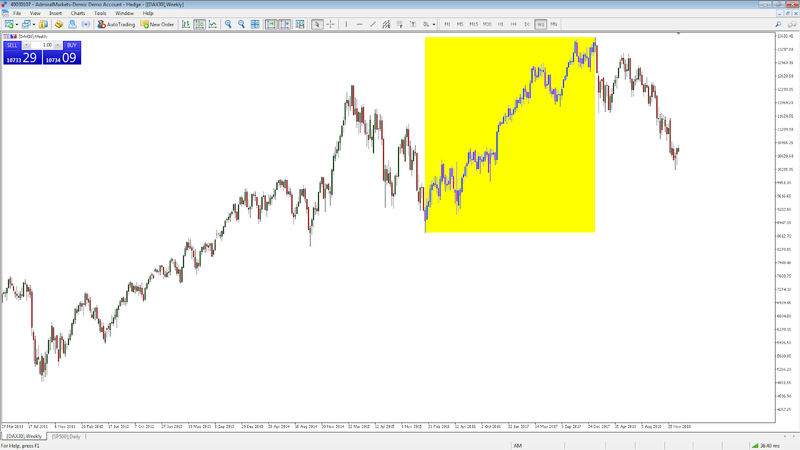 Source: Admiral Markets MT5 with MT5SE Add-on DAX30 Weekly chart (between 27 March 2011 to 7 January 2019). Accessed: 7 January 2019 at 11:00 AM GMT. Please Note: Past performance is not a reliable indicator of future results, or future performance. The ‘free money’ circulating in the Eurozone helped to lift the DAX30 stock market index for some time, as highlighted in the yellow box in a screenshot of the chart above. That was until the ECB started to talk about cutting back on their bond buying programme in 2018 – which, among other reasons, triggered a decline in the index. With no further support from the central bank, sellers remain firmly in control. And, with the DAX30 now officially in a bear market there could be more pain ahead. How will you be trading it? Now that the ECB has stopped creating ‘free money’ into the economy, there will essentially be less euros in circulation. This could spell good news for the euro currency, which is at an interesting technical juncture. Source: Admiral Markets MT5 with MT5SE Add-on EURUSD Monthly chart (between 1 October 2014 to 7 January 2019). Accessed: 7 January 2019 at 11:20 AM GMT. Please Note: Past performance is not a reliable indicator of future results, or future performance. 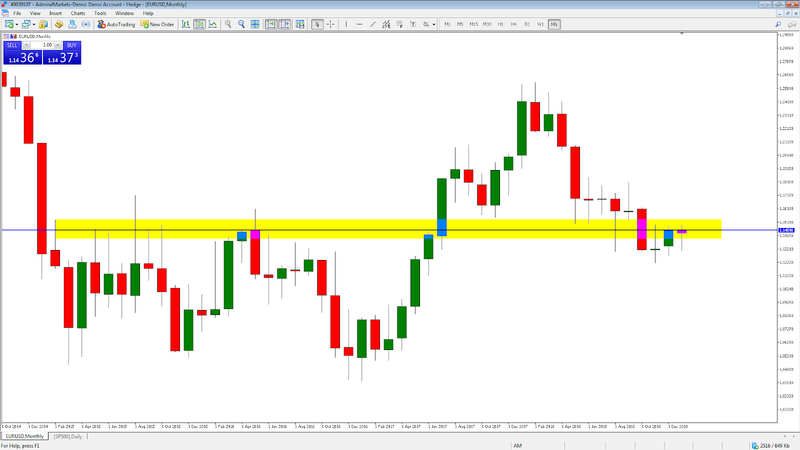 In the above chart, the horizontal line and yellow box highlights a significant area for the EURUSD currency pair. The market rejected the price level many times in 2015 and 2016, before finally breaking higher in 2017. With the market now trading above the price level, some traders will be using this as a technical support area for the euro currency to rise – will you? #2 Will the US bond market trigger an economic recession? However, there is one market that has professional investors and hedge fund managers very worried – the US bond market. Specifically, traders are worried about an ‘inverted yield curve’ – which triggered in December 2018, for the first time in almost a decade. An inverted yield curve is where short term bond yields rise above those for longer term dated bonds. This means traders are more bearish in the long term than the short term. Most importantly though, major economic downturns have been preceded by an inverted yield curve. US bond yields, like the 10-year treasury bond, reached a seven-year high in 2018. As yields and bond prices have an inverse relationship, the price of a 10-year treasury bond has just reached a critical seven-year low. Source: Admiral Markets MT5 with MT5SE Add-on #USTNote Monthly chart (between 1 June 2009 to 7 January 2019). Accessed: 7 January 2019 at 11:55 AM GMT. Please Note: Past performance is not a reliable indicator of future results, or future performance. In the chart above of the US 10-year treasury bond, the market has most recently bounced off long-term horizontal support, denoted by the blue line. As this chart goes up, bond prices go up. And, if a recession is to come in 2019 – as some investment banks are predicting – there could be further upside to come in bonds prices. Is it on your watchlist? 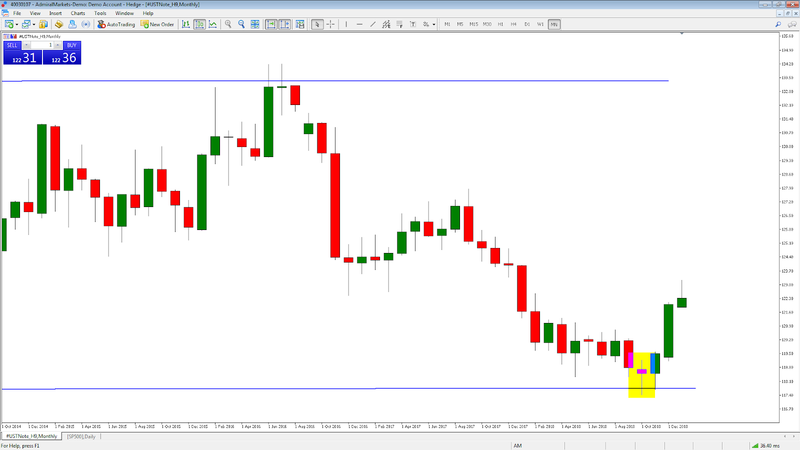 Trading simple price action based strategies can be effective, even across different markets. 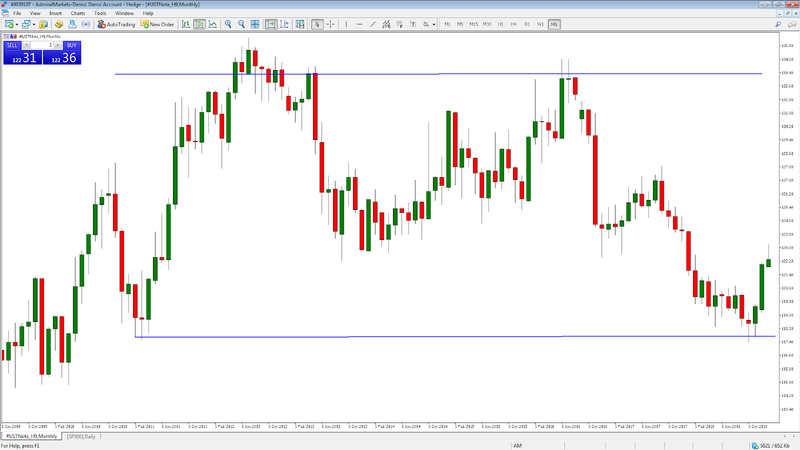 For example, the pin bar reversal – highlighted in the yellow box below of the monthly chart – signifies the possibility of a move higher from the blue horizontal line. Source: Admiral Markets MT5 with MT5SE Add-on #USTNote Monthly chart (between 1 October 2014 to 7 January 2019). Accessed: 7 January 2019 at 12:05 PM GMT. Please Note: Past performance is not a reliable indicator of future results, or future performance. If a trader entered a two lot long position above the high of the bar at $119.16 with a stop loss at $117.41, then the risk on the trade (or total loss) would be $350. However, if the trader held to $122.47 – the next level of resistance from the December 2016 lows – the profit would have been $662. The Admiral Markets trading calculator can help you risk manage your positions when trading these major themes of 2019. The Analysis is prepared by an independent analyst based on the Author’s (Jitan Solanki, Freelance Contributor) personal estimations.